Luca De Meo announced his resignation from Fiat group today. In a statement, the 41-year-old Italian said that at his age he feels he needs "to pursue new professional challenges." He added that he will have fond memories of his seven years with the company because it gave him the chance to face "tough but stimulating challenges." In the same statement, Fiat group CEO Sergio Marchionne praised De Meo's performance at the company and said he is sad to see him go. "At the same time, I understand that a young and talented executive like Luca would feel the need to have new experiences in new companies," Marchionne added. 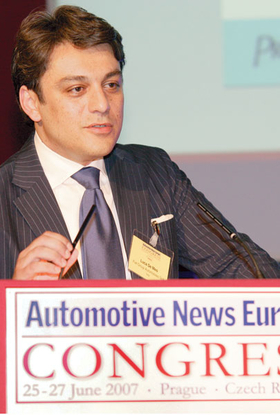 De Meo is Fiat group chief marketing officer as well as CEO of the Alfa Romeo and Abarth brands. No successors have been named. The native of Italy joined Fiat group in 2002 as head of marketing for the Lancia brand. He was soon named head of Lancia. In September 2004, Marchionne asked the then 37-year-old De Meo to turn around the struggling Fiat brand. He held the Fiat brand job until he was given the groupwide marketing position in September 2007. He added control of Alfa in December 2007, making him the first person ever to run four of Fiat Group Automobiles' six brands during his career. Before he started at Fiat, De Meo worked at Renault and Toyota Motor Europe.